Toronto, ON – The Ontario Hockey League today announced the results of the Eastern and Western Conference Coaches Polls for the 2018-19 OHL regular season. The Storm were represented in 10 different categories with five players spread across the votes. Oilers prospect Dmitri Samorukov appeared in three categories and finished first in two of them including Best Body Checker and Best Defensive Defenceman. Storm forward Nick Suzuki, a Montreal Canadiens prospect, also appeared in three different categories winning the Smartest Player vote. 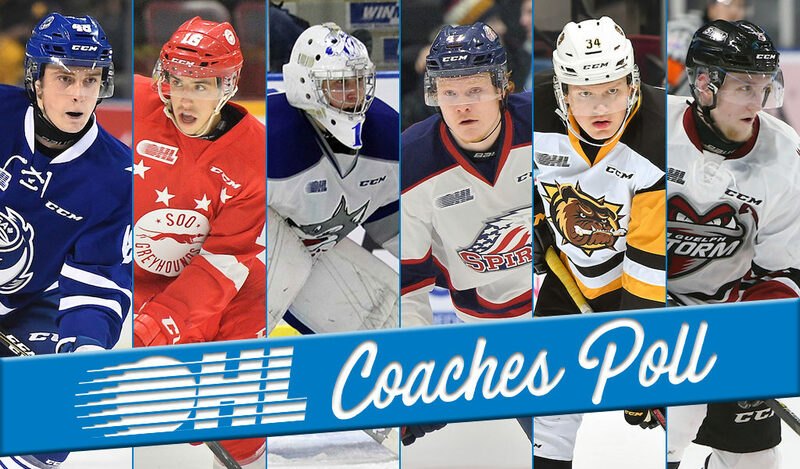 The OHL Coaches Poll provides member club coaches with the opportunity to recognize the top three players in 20 different skill categories within their own conference. In the Eastern Conference, the Hamilton Spectator Trophy winning Ottawa 67’s lead the way with eight players represented inside the top three votes across nine different categories. Among them is rookie Marco Rossi who was the club’s only top vote getter recognized as the Smartest Player. 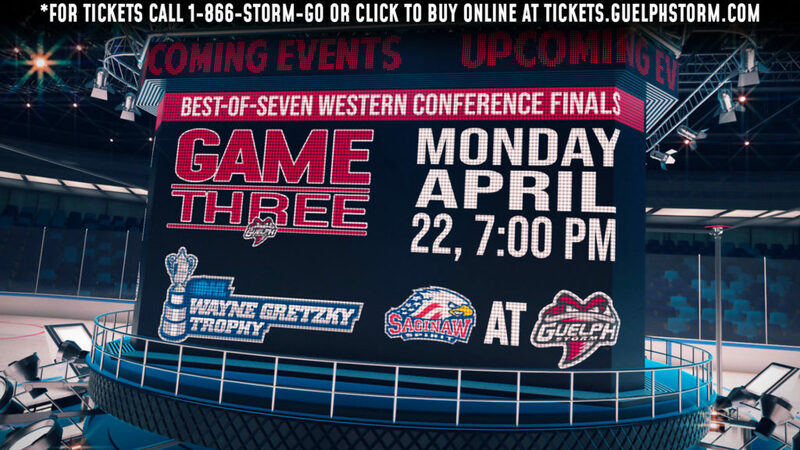 The Oshawa Generals had seven players voted across nine different categories and finished tied for the Eastern Conference lead with four first place votes including Brett Neumann (Best Skater), Mitchell Brewer (Best Shot Blocker), Kyle MacLean (Best Defensive Forward), and Kyle Keyser (Best Puck Handling Goalie, tied). The Hamilton Bulldogs also placed first in four different categories headlined by Arthur Kaliyev atop two of them including Best Shot and Hardest Shot. 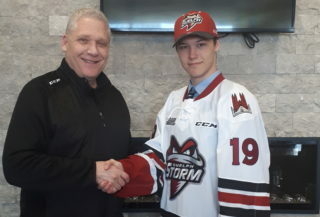 Fellow 2019 NHL Draft prospect Thomas Harley of the Mississauga Steelheads also led his club in two of their four first place votes including Most Improved Player and Best Offensive Defenceman. Buffalo Sabres prospect Ukko-Pekka Luukkonen of the Sudbury Wolves was also first in a pair of categories including Best Shootout Goaltender and tied with Keyser for Best Puck Handling Goalie. Justin Brazeau of the North Bay Battalion was the only player to appear as a top three finisher in four different categories winning the Most Dangerous in the Goal Area vote. Kaliyev and Harley both had a trio of top three finishes along with the Barrie Colts pair of Ryan Suzuki and Jason Willms who both claimed first place votes in Best Playmaker and Best on Face-Offs respectively. 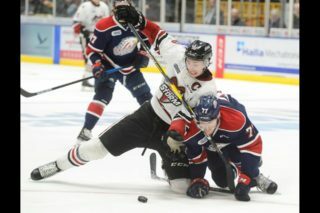 Detroit Red Wings prospect Zach Gallant of the Peterborough Petes finished behind Willms in the face-off category but was recognized as one of the best for a third straight season. Gallant was one of eight players to appear in two categories along with fellow Pete Ryan Merkley, Generals MacLean and Keyser, Wolves Luukkonen and Macauley Carson, Sasha Chmelevski of the 67’s, and Philip Tomasino of the Niagara IceDogs. In the Western Conference, the first place London Knights lead the way with nine different players spread across 11 of the 20 different categories. Edmonton Oilers prospect Evan Bouchard is the only Knight to appear in multiple categories voted third Smartest Player for a second straight year, second Hardest Shot after winning the vote last season, and third Best Offensive Defenceman after finishing first a year ago. The Knights were represented in first place votes by Ottawa Senators prospect Alex Formenton picked Best Skater for a second straight year, and Columbus Blue Jackets prospect Liam Foudy who tied for first in the Best Penalty Killer vote. The Sault Ste. Marie Greyhounds were also represented in 11 different categories with five different players receiving top three votes including a total of five first place selections which tied for the Western Conference lead. Philadelphia Flyers prospect Morgan Frost led the West by finishing first in three of them including Best Playmaker and Best Stickhandler both for a second straight season, along with Best Shootout Shooter. He also finished second in the Smartest Player category after winning the vote a year ago. The West Division winning Saginaw Spirit were represented by six players across 10 different categories and tied the Greyhounds with five first place votes. Among them was Florida Panthers prospect Owen Tippett who was voted first two times including Hardest Shot along with Most Dangerous in the Goal Area after appearing second and first in the last two Eastern Conference polls. 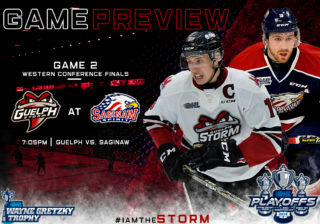 10 players were recognized in two different categories including Tippett and fellow Spirit including captain Damien Giroux, and defencemen Bode Wilde and Justin Murray, Greyhounds Mac Hollowell and Matthew Villalta, Storm captain Isaac Ratcliffe, Firebirds captain Ty Dellandrea, Sting captain Ryan McGregor, and Jonathan Yantsis of the Kitchener Rangers. Also of note, Windsor Spitfires captain Luke Boka was voted Best Shot Blocker for a second consecutive season. The Coaches Poll is tabulated when each team submits one nominee per category, and coaches then vote for the top three players for each category within their conference. Players receive five points for a first place vote, three points for a second place vote, and one point for a third place vote. Clubs are not permitted to vote for players from their own team allowing for a maximum of 45 possible points for each winner. All 20 categories are listed below with Eastern Conference and Western Conference winners including their final point totals in brackets.